Personal trainer and author, Jim Karas, describes his controversial approach to fitness and weight loss in The Cardio Free Diet. Karas claims that cardio exercise is not only unnecessary but may actually be interfering with your weight loss goals. Cardio exercise has long been touted as being essential for increasing calorie burning but Karas declares that cardio workouts burn far less calories that we expect and also increase appetite so that any potential benefits are lost. The result is that cardio causes weight gain by triggering us to increase our intake of food and to consume more calories that we would otherwise. Karas also claims that the body adapts to cardio exercise over time so that it is necessary to keep doing more and more cardio in order to get the same calorie burning effects. In addition to this, Jim Karas also declares that cardio may be very bad for long term health by impairing immunity and increasing inflammation in the body which may increase the risk of cancer and heart disease in later life. Although Karas states that it is possible to eat anything on his program he does actually give recommendations to either eliminate or severely limit the intake of refined carbohydrates, sodas, juices and salad dressings. Dieters are advised to always eat breakfast and never skip meals. Karas recommends three meals per day along with three small snacks. He also advises to have a 100 calorie snack both before and after workouts. The rationale for this approach is to boost the metabolism and provide fuel for the muscles when it is needed. In the initial stages of the diet women are recommended to commence with a calorie intake of 1200 and men 1500 calories per day. Once the target weight is reached Karas recommends gradually increasing up to 1500 calories a day for women and 1800 for men so as to prevent weight regain. Dieters are instructed to eat dairy foods and take a calcium supplement daily because studies have shown a relationship between weight loss and calcium. (The validity of this has recently been brought into question). High fiber carbohydrates are recommended to help control blood sugar balance and prevent cravings. One glass of wine is allowed daily. More recipe ideas can be found here. Karas recommends we all ditch the cardio and instead perform weight training and resistance exercises for 20 minutes, 3 times a week, while following a calorie controlled diet. Despite the ‘no cardio’ stance Karas does state that walking and light biking are acceptable. Walking on a treadmill is also acceptable, but it’s recommended that you do your homework and read reviews of treadmills as some are better for walking than others. These resistance exercises can be used with the Cardio Free Diet. The Cardio Free Diet Retails for $14.95 US. Speaks to those who have been doing a lot of cardio exercise but not seeing any results. Weight training can help build lean muscle which boosts metabolism and promote an improved body shape. Requires calorie counting and strict portion control. Calorie recommendations are very low and it will be difficult to meet all nutritional needs on this plan. 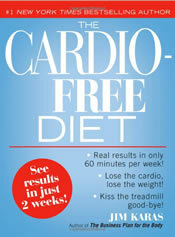 Conflicts with many years of research supporting the positive health and weight loss benefits of cardio exercise. 20 minutes of exercise 3 times a week is unlikely to produce good results especially in intermediate or advanced exercisers. Although Karas does provide some information about research on the effects of cardio on marathon runners it appears that most of his conclusions are related to his own personal experience and opinion. Karas’ main focus is on using weight training to boost metabolism however his diet program is fairly low calorie which will also tend to reduce metabolic rate over the longer term. Karas also fails to note that some forms of cardio exercise such as interval training have been shown to increase metabolism. Furthermore many studies have shown that cardio reduces the risk of heart disease, diabetes and cancer in addition to being one of the most reliable predictors of weight maintenance following a weight loss program. The Cardio Free Diet may be of benefit to dieters who have been spending hours on the treadmill but not getting the desired results however the advice to abandon all forms of cardio exercise does appear extreme.